Twenty-seven days to the conduct of the general elections, the Federal Government on Tuesday in Abuja alleged that the opposition had resorted to mobilising bandits and members of the Boko Haram to cause crisis in order to stop elections in the country. It further alleged that the masterminds of the plot were also planning to attack some state governors. 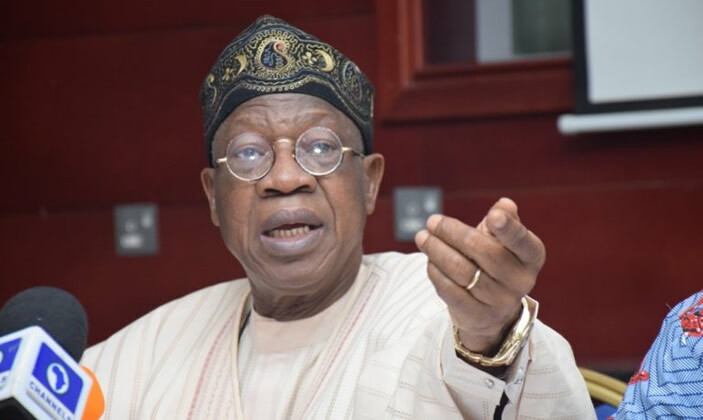 The Minister of Information and Culture, Alhaji Lai Mohammed, made the allegations at a press briefing. He said the plan of those behind the plot was to derail the conduct of the general elections and thereby foist an interim government on the nation. Though he refused to mention those behind the alleged plot, Mohammed said the masterminds had realised that “their fortunes have dwindled badly ahead of the polls,” adding that the “desperate opposition is orchestrating widespread violence with a view to truncating the elections, thus triggering a constitutional crisis that could snowball into the establishment of an interim government.” He said the government was already in possession of what he called credible intelligence to the effect that the alleged widespread violence was being plotted by the opposition. Among the states which the minister alleged had been marked for attack included Adamawa, Bauchi, Benue, Kano, Nasarawa, Plateau, Kaduna and Zamfara. He said, “As you are aware, Nigeria goes to the polls just 27 days from now. However, the Federal Government is in possession of credible intelligence to the effect that widespread violence being orchestrated by the opposition is threatening the 2019 general elections. “Before you accuse the government of crying wolf, let me tell you, gentlemen, that we have credible intelligence that bandits and Boko Haram insurgents have been mobilised to engage in massive attacks and other acts of violence in several states across the country, including Adamawa, Bauchi, Borno, Benue, Kano, Kaduna, Nasarawa, Plateau, Taraba and Zamfara.” The minister further alleged that a criminal group in Benue State, whose leader had been declared wanted, had been contracted to cause mayhem in some states. Those states, he said, were Benue, Nasarawa and Taraba. READ ALSO: CSOs petition AGF over detention of Abuja activist In the case of Kano, Mohammed said a group of those he described as notorious miscreants, had been mobilised by some opposition leaders whose identity he refused to disclose, to provoke massive chaos before, during and after the elections. Govt says opposition planning to attack N’West govs Mohammed said, “There is also an international dimension to the evil plan. Some (armed) mercenaries from Niger Republic have been contracted to attack top government functionaries, including state governors, across the North-West between now and the elections.” The minister said, “Some (armed) mercenaries from Niger Republic have been contracted to attack top government functionaries, including state governors, across the North-West between now and the elections.” Asked to reveal the identity of those already identified in the alleged plot, Mohammed declined just as he refused to agree that the Federal Government could be seen to be using the ‘security reports’ to haunt members of the opposition. But he assured Nigerians that there were no plans to shift the elections, adding that the “Federal Government is taking every possible measure to counter these evil plans by unpatriotic anarchists and ensure the success of the 2019 general elections.The administration’s commitment to a credible, free, fair and peaceful election is unshaken.” The minister called on Nigerians to be vigilant in the days ahead and also appealed to the media to help in sensitising members of the public to the alleged threats, which he said, “are capable of disrupting the elections.” The minister, who said he would not entertain questions outside the topic of his briefing, however, said the government would not show any proof to convince Nigerians about the alleged plot. FG’s allegations are irresponsible, ludicrous – PDP In its reaction, the Peoples Democratic Party said the minister’s allegations were the machination of the All Progressives Congress and the Muhammadu Buhari presidency. It stated that there was no member of the opposition that was planning to foment trouble or cause mayhem that could lead to a constitutional crisis or an interim national government. The PDP National Publicity Secretary, Kola Ologbondiyan, in an interview with journalists in Abuja, said the party would not accept results of rigged elections. He said, “It is imperative to state that the PDP finds the claims of Alhaji Lai Mohammed, irresponsible and ludicrous. It is just a measure for building the ground for framing up and arresting of leading members of the opposition as he has just confirmed our concerns. “There is no member of the opposition anywhere that is planning anything outside defeating President Muhamamdu Buhari on February 16 and they know this is for real. They are aware that Nigerians have reached a consensus that a President who will carry a flag that is meant for a gubernatorial candidate and say he is handing over to a presidential candidate is no longer fit to go back.” Ologbondiyan said it was the APC and its government that were planning an interim government because they realised that they could not win an election. FG’s allegations, sign of defeat phobia – CUPP Also, the Coalition of United Political Parties, said the Federal Government’s allegations were a sign of “defeat phobia.” The national spokesperson for the CUPP, Imo Ugochinyere, who said this at a press conference in Abuja, noted that the plan was for the government to frame opposition leaders and arrest them ahead of the elections. Describing the allegations as outrageous and laughable, he said opposition parties did not and would not support bandits to disrupt elections that they were destined to win. He said, “This accusation is outrageous and a clear sign of mental disorientation. The Presidency is plotting to frame opposition leaders with fake allegations, using one of its vessels. “The fear of defeat has now made Buhari’s government to be running from pillar to post and throwing baseless allegations with no facts to substantiate, all in a bid to frame the opposition.” However, the Organising Secretary of the APC in Bauchi State, Abdulkadir GyanGyan, said the PDP campaigns had shown that the opposition was planning violence. He stated, “ If you look at the way they are carrying out their campaigns and going by the pronouncements of their leaders, there is nothing good coming from them, they just talk like thugs.” But state Chairman of the PDP, Hamza Akuyam, dismissed the allegations as baseless, saying”I don’t know where he got such information from, there is nothing like that.” The APC in Plateau State on Monday described the minister’s allegations as real saying that “there is no smoke without fire.” The state Secretary of the party, Mr Bashir Sati, who spoke with one of our correspondents, said, “The PDP has been making many allegations against us without anything to substantiate its claims. So when you put all these things together, the person who said that the PDP was planning to disrupt the polls in the state might have seen something.” But the Chairman, Media and Publicity of the state PDP Campaign Council, Mr Yiljap Abraham, said anyone planning to disrupt the polls must be an APC member. However, the APC Publicity Secretary in Benue State, James Ornguga, said the party knew that Governor Samuel Ortom had planned to use the disbanded livestock guards to rig elections. “But we (the APC) have raised the alarm few weeks ago that Ortom-led PDP had been raising bandits to disrupt the coming election.Last week in Kwande during his campaign, Ortom boasted that he would win the coming election at all costs. But the Publicity Secretary of the PDP in the state, Bemgba Iortyom, described the APC’s allegations as unfounded.